Our West London Dental Practice aims to provide a high standard of customer care to our patients in a relaxed environment. Our dentists are continuously developing their skills through post-graduate education with the aim of providing the highest quality of care in general, cosmetic and implant dentistry. 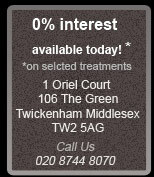 We also provide a comprehensive range of treatments for nervous patients under dental sedation.